March and April have turned out to be my lowest numbers of posts since I started this blog ! Busy new job has kept me from posting- but I have lots of new recipes to put up here. 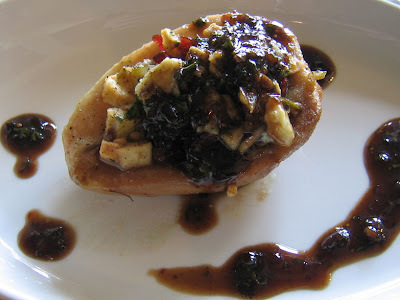 Like this Baked Stuffed Pear with Fig Dressing that was the salad course for our Easter dinner. Extremely yummy, easy and healthy even!! The Fig Dressing is sweet, balancing out the blue cheese and pepper. I've since used this dressing on a zucchini and squash tart as well as on a panini. I'm really enjoying cooking with figs, but I'm having a hard time finding good figs in Chicago. So in this recipe I use a simple fig jam found at any supermarket- it's quite tasty and fun, but feel free to substitute real figs if your lucky enough to get them! This could be a salad course, a side salad or an appetizer; it's quite versatile. This could easily pair well with a grilled steak, I'd grill the pears for added flavor too. Add the blue cheese to your liking, but it does balance out the sweet fig dressing, so don't be too cautious with it. This is an easy dish that looks like it could be on a menu in an fancy restaurant. Have fun with it- I made this up with simple ingredients which keeps its cost effective (especially for a larger dinner party) and super tasty at the same time. Elevate your Fat and Happy stature, add this to your next dinner party! Peel the pears, cut in half and scoop out the core so that you have a nice big 'bowl' in the pear. Mix the melted butter and oil; dip the pear halves in the butter mixture. Place on a pan, add a little fresh ground pepper and bake until near soft and roasted (About 20 minutes). continue to sautee until soft, but still fork tender. The filling can be made ahead of time. Once the pears are ready- stuff the pears with the filling. Place back in the oven until all is warm and the cheese is melty. Serve drizzled with the Fig Vinaigrette (recipe below). 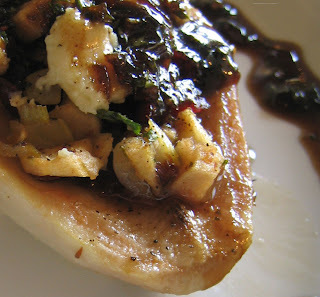 add 3 Tbls balsamic vinegar to pan, turn off the heat and let steep for about 20 minutes.